Will the new normal for interest rates be lower than the old? 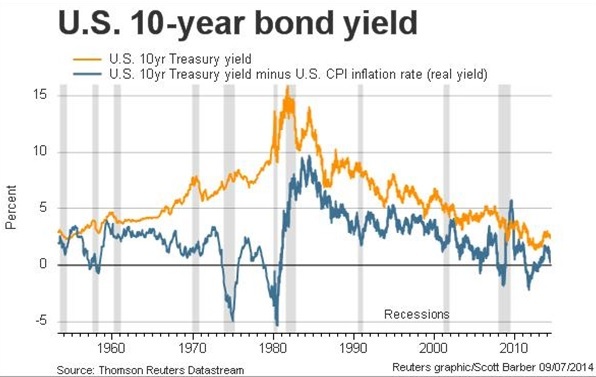 It is rapidly becoming conventional wisdom that years of near-zero overnight rates will be succeeded by an indefinite period in which borrowing costs remain low by the standards of the last few decades. The new consensus is reflected in financial markets: the yield on 30-year U.S. Treasury bonds has fallen from 4 percent to 3.4 percent this year. But it is built on unsound foundations. Of course, predictions from central bankers should be discounted. When William Dudley, the president of the New York Federal Reserve and Mark Carney, governor of the Bank of England, state that they do not expect overnight rates to return to historical averages, they are partly engaging in very long-term forward guidance. They are trying to prevent the fear of higher rates in future from discouraging activity today. But Dudley and Carney are not simply making things up. Like UBS economists, who predict that yields on 10-year government bonds in developed countries will peak at 3 percent to 4 percent, they are relying on a basic claim of financial theory: the equilibrium interest rate is the nominal growth rate. In simple terms, this means that when the economy is functioning well, the overnight interest rate will be the same as the sum of the real growth rate and the inflation rate. Longer-term and riskier loans require a somewhat higher yield to compensate for inconvenience and possible losses. The theory suffers from three crippling problems. First, it relies on hugely unrealistic assumptions about knowledge and behaviour. In particular, investors are supposed to be able to predict the future path of both inflation and growth and to calmly use their knowledge to set the risk-free rate. Any resemblance to reality is coincidental. Economists generally defend their implausible assumptions by claiming that the theory comes up with accurate predictions. That brings up the second problem: the evidence does not firmly support this view. A fair test of the theory is not possible before inflation rates and GDP were measured with any accuracy, sometime after World War Two in most developed economies. Since then, yields on debt of all maturities have been roughly correlated with recent inflation rates. However, the relationship is too imprecise to see if real growth rates, which have changed far less than inflation, have any influence. Finally, even if the theory is somehow relevant, it is in practice useless. To serve as a guide to future interest rates, it requires accurate predictions of both inflation and growth. These are anybody’s guess. Virtually no one predicted the rise of inflation in the 1960s and 1970s. An equally tiny group predicted the strength and length of subsequent disinflation. Central banks have been no better than outside economists. There is no reason to think the profession can do better now. If real growth is relevant to interest rates, as the theory holds, the uncertainly is almost as great. The actual rate at which an economy expands is hard to measure and harder to predict. In sum, the crystal ball remains totally cloudy. Predictions of low rates may be made confidently, but they are too unreliable to be taken seriously. In practice, they are basically projections that the present state of affairs – disinflation and low growth rates – will continue indefinitely. It is certainly possible that yields on long-term government bonds will settle around 3 percent, or even lower. But the future may not be like the recent past. The global economy has surprised the experts many times in the last century. It is also quite possible that inflation will move higher, or that investors will find some other reason to push yields up. The new normal could well be 5 percent, or even higher.